There is plenty to see and do in the area. Regardless of season, Cloudcroft has plenty for everyone. Enjoy hiking, biking, snow shoeing, sledding, bird watching, rock climbing, horse-back riding, fishing, ice skating, shopping, dining, golf, tennis, basketball, disc golf, hang gliding, picnicking, star gazing, or best of all, just relaxing away from the stress of everyday life. Cloudcroft New Mexico is located on U.S. Hwy. 82 and is easily accessible from both east and west. The western approach from Alamogordo (north of El Paso, Texas, on U.S Hwy 54) is a steep 16 mile climb of nearly 5,000 vertical feet that takes travelers through a variety of climate zones. The charming mountain village of Cloudcroft owes its existence to the beauty that surrounds it. In 1898, an El Paso-Northeastern Railroad crew was laying out the route for the famous Cloud Climbing Railroad and stopped to rest on the summit of the Sacramento Mountains. Standing under the tall, cool pines, the crew looked west to the vibrant slash of Whites Sands almost 5,000 feet below and picked their resting place as the site of the railroadç—´ lodge. Impressed by the white clouds slipping by at almost ground level, it was a young Englishman in the party who chose the name of Cloudcroft, meaning a cloud in a field. Beautiful scenery and spectacular unspoiled vistas are encountered at every turn of the highway. In particular, the view from the overlook near New Mexicoç—´ only tunnel and the graceful old wooden Mexican Canyon trestle that nestles in a canyon just outside of the village should not be missed. This much photographed remnant of the old logging and excursion railroad has come to be a kind of unofficial symbol of Cloudcroft. High mountain meadows and cool air are a welcome relief from the surrounding desert on either approach. Warm summer days are sprinkled with mountain showers that come and go quickly but which leave behind a variety of wildflowers that blanket the meadow and line the roads. Summer temperatures reach the upper 70ç—´ but the nighttime lows remain in the cool 40ç—´ and 50ç—´. 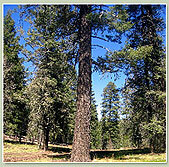 Cloudcroft is a quiet, relaxing and scenic village with year round activities. The Chamber hosts a full calendar of events that attract thousands and thousands of visitors annually. With four lovely seasons and an old country way of life Cloudcroft has something for everyone and we will make you feel right at home. ï½© 2006 Bear Ridge Log Cabin. All rights reserved. Layout & Design Rob Roberts Productions.